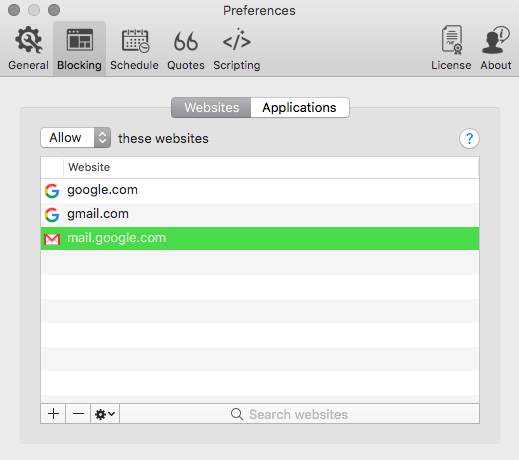 Block any kind of URL you want, including a specific page, an entire website, or exceptions for websites that are already blocked. Why Block Websites or Applications? It's easy to get sidetracked while you're working. You may get a little frustrated and say to yourself "I'll just check to see if anyone's replied to my status" or "I wonder what response I've gotten to my last tweet" or even "Lemme jus' do a li'l 'research' on Pinterest". Then before you know it, two hours have passed and you've made little progress on that project. It happens to all of us. Sometimes you just need a little help to keep you focused and to help you maintain your discipline. Now, while not everyone likes having someone watch over them, constantly reminding them about that looming deadline, it does help to have the more tempting distractions a little further out of reach. With that in mind, Focus also provides Blocking. When activated Focus blocks selected websites from being accessed and selected programs from starting and running. In a slightly augmented operation, Focus can even block ALL websites, while only allowing a particular set of sites to be accessible. The former list is known as the Block list (blocked websites) and the latter is known as the Allowed list (accessible websites). Each of these operations is run exclusively. You cannot use both lists at once, you'll have to choose one operation or the other. Note: The blocked list and allowed list only apply to websites. Once Focus is activated, all programs listed in the Block Applications list will be blocked, regardless of whether the blocked list or the allowed list is applied. The Blocking Window presents all the relevant info on the Blocking function. To see it click the focus icon in the menubar. From the context menu select Preference. This will bring up the Preferences window. From here, select the Blocking tab (2nd from the left). This will present the Blocking page. The Blocking page has two modes: Websites and Applications. The screen capture shows us the Websites sub-page. To see the Applications sub-page, simply click on Applications at the top center-left of the page. As mentioned before, there are two main operations for the Blocking function: the blocked list and the allowed list. The blocked list presents a list of websites which will be blocked by Focus while it is activated. All other websites will still be accessible. The allowed list presents a list of websites which will be allowed by Focus and accessible via web browsers while Focus is running. All other websites will be blocked. To select which operation will be applied in Focus, click the field in the top left corner of the page. This will present a drop down list. From this list you must select either Block or Allow. Once Block has been selected the blocked list function will be activated and the Block Websites list will be presented. This list contains all websites which will be blocked by Focus while all other websites will still be accessible. Once Allow has been selected the allowed list function will be activated and the Allow Websites list will be presented. This list contains all websites which will be allowed by Focus while all other websites will be blocked. To add a website to the list, click the Plus (+) icon in the lower left corner of the page. A new spot will be activated on the list above, allowing you to enter the new website address. Addresses may be submitted with or without their "www" prefixes (this would actually make Focus even more strict, preventing access to other site versions such as mobile, which usually have a "m" prefix). Once you've filled the web address, hit Enter and you're done. This method applies to both the Block list and the Allow list. Note: URL subdomains and paths may be used for greater specificity in blocking or allowing websites. For example, you may wish to block the Sports section of CNN (edition.cnn.com/sport) while retaining access to the rest of the CNN news website. To remove a website from one of the lists, first highlight the site you'd like to remove by clicking on it. After that, click the Minus (-) icon in the lower left corner of the page. Boom. You're done. Site removed. You may remove any site on the list, even those that come preloaded with Focus. You can wipe the lists clean and include your own combination of sites for blocking or access. If you'd like to change any details of a website in the list (add or remove a path, for instance) then simply double click the site in the list which you would like to edit. This will make the site entry editable, allowing you to tweak it to your liking (including changing the site altogether). When you're done, just hit Enter. Do you have a combination of blocked sites that really works for you and has raised your productivity? Want to share that with a friend? We've got you covered. You can export your list of blocked websites to a text file and email it to your friend so that they can use it for their Focus. They can even peruse the list before loading it themselves because we've made it to be a human-readable text file. To export your website list, click on the Gear icon in the lower left corner. This will present you with a context menu. From that context menu, select Export Websites. This will present a Finder window, allowing you to select the folder to save the export file in. Once you've found the folder you want to save the export file in click Open. File saved. This applies to both Block and Allow lists. Note: Exporting a website list only exports the list which is activated. If the blocked list is activated, only sites in the Block list will be exported. If the allowed list is activated, only sites in the Allow list will be exported. You've just received a Focus export list from a friend and want to apply it to your own Focus. Awesome. First thing, read the title of the export file. Is it a Blocked Websites list file or an Allowed Websites list file? Whichever one it is, make sure you're importing the correct file in the correct mode. Let's assume it's a blocked list file. Follow the aforementioned instruction on selecting your Block or Allow list and select the Block list. Click the Gear icon in the lower left corner and, from the context menu, select Import websites. This will present a Finder window. Navigate to the folder containing the Export file, select it and click Open. 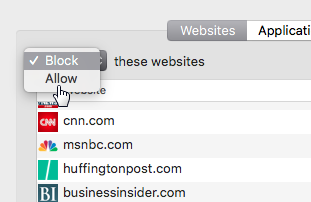 The newly imported list of Blocked websites will now populate your Block list. At the top right of the Blocking page, select Applications. This will present you with the Blocked Applications list. Programs on this list will not start, run nor be otherwise accessible while Focus is activated. To add a program to the Block Application list click the Plus (+) icon in the lower left corner of the page. This will present you with a Finder window. It should default to the Applications folder but if this is not the case then simply click on Applications in the Favorites list in Finder. Once there, scroll to the application you wish to block, select it and click Open. That application will now be added to the Block Applications list and will no longer activate while Focus is running. To remove a program from the Block Application list simply click on the application within the list which you'd like to remove, highlighting it, and click the Minus (-) icon in the lower left corner of the page. That's it. Application removed. 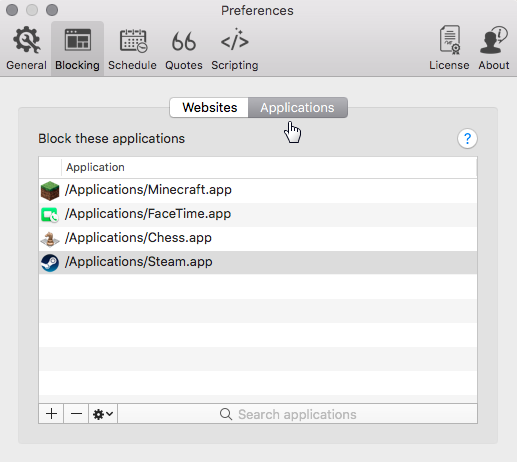 The method for exporting your list of Blocked Applications is the same as exporting your list of Blocked (or Allowed) websites. Click the Gear icon in the lower left corner of the page and select Export Applications from the context menu. This will present a Finder window, allowing you to select the folder to save the export file in. Once you've found the folder you want to save the export file in click Open. File saved. As you might've guessed, the method for importing a list of Blocked Applications is identical to importing a list of blocked or allowed websites. Click the Gear icon in the lower left corner of the page and select Import Applications from the context menu. This will present a Finder window, allowing you to navigate to the folder which has the blocked applications export list that you'd like to import. Once you've found the file you need, select it and click Open. Your blocked applications list will now contain programs from the freshly imported list. Did something go wrong somewhere or do you feel like starting over? If you want to revert to the original list of blocked and allowed sites and blocked applications then that's as easy as a few clicks. For whichever list you'd like to revert to its defaults, navigate to that page (Websites or Applications). If you'd like tor revert one of the website lists then make sure that you select the correct list (Block or Allow). Once you're on the page you want, click the Gear icon in the lower left corner of the page and, from the context menu, select Reset to defaults. This will present you with an Alert window asking you if you are sure that you'd like to continue and advising you that what you are about to do cannot be undone. If you are sure that you'd like to proceed click OK. The list will now be populated with its default entries. Blocking by domain vs URL is something Focus handles silently behind the scenes. Here's how everything works. The main Facebook domain will be blocked, including www.facebook.com. However, a website like https:///developers.facebook.com/ wouldn't be blocked. 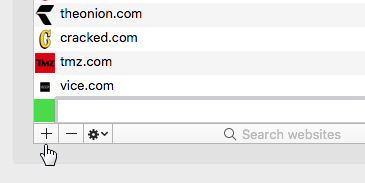 This tells Focus, block every single subdomain on this page (including the main domain itself). But sometimes we don't want to block the entire domain. Anytime you start a rule block with http you know that you're blocking a single page, not an entire domain. Focus will block just this webpage, it won't block Facebook.com or any other subdomains. That's because we've specified the http (in this case https) before the URL. That covers the basics, but blocking can get even more advanced, to learn check out Advanced URL Blocking.